SocialCops recently worked with Tata Trusts as a data and technology partner to conduct two census surveys in Chandrapur (Maharashtra) and Noamundi (Jharkhand). Chandrapur and Noamundi are some of the most backward areas in their states. The areas have difficult terrain with little or no access to phone connectivity and electricity. The large-scale census surveys collected data for over 60,000 households within 2 months using tablets. The data was then used to help in micro-planning activities in the area. SocialCops’ challenge was to train local people to collect this data while overcoming operational challenges that arise throughout the survey. These are some of our major learnings and hacks from these two surveys. When surveying in tribal areas of Maharashtra and Jharkhand, we often couldn’t find cellular connection, let alone internet, for hours. Sometimes we had to travel up to 8 hours to reach areas with cell or internet connectivity. We used our Collect app to collect data offline throughout Chandrapur and Noamundi. Collected data was synced to our servers at the end of the week. It’s interesting how we had to anticipate social dynamics since they could intervene with our work. In one village, our field manager caused problems because he spoke to a woman. This caused problems since men were not supposed to speak to women in that village. It is always a good idea to have a gender-balanced team of surveyors and monitors. This will help to navigate most social norms. We used Census village lists to decide which villages that we should survey. However, we were sometimes left searching for villages that didn’t exist. Though it is standard practice to trust Census records, try asking local coordinators for a list of villages. Each geography is unique with its own set of demographic, geographic, social, and economic problems. It’s important to tweak each survey for its specific geography. Even after consulting experts and doing two rounds of piloting, surveyors were still calling our team for changes in the survey. With Collect, we can edit surveys in the field and sync those changes on all other devices. This helped us tweak our surveys on the go. Read more about how piloting can help improve the quality of your data. Any large-scale census survey usually involves a train-the-trainers model. This means that we train people who then train the surveyors, rather than us training the surveyors directly. This indirect method can lead to knowledge leaks as information is transferred from person to person. Closely monitor surveyors’ training, since that training can make or break a survey. A good training can reduce survey bias, while a bad training leads to incorrect data. It can be difficult to get enough bandwidth to download a phone app while working in rural India. However, all the tablets used in our census surveys needed Google Play Services (used for updating the phone’s location, scanning barcodes, and more), which required 46 MBs to download. How could we do this for 350 tablets? Instead of trying to directly download the file to the tablets, we used our own jugaad. We first downloaded Google Play Services to our computer, then we transferred the file to all 350 tablets over USB. If we later found a tablet without Google Play Services, we used ShareIt to share Google Play Services over Bluetooth. Even basic functions like downloading apps might not work in certain areas. Be ready to do some extra work. If you think the fact that you are paying surveyors gives you leverage, think again! Our surveyors didn’t let us collect our tablets until their checks were processed — something we didn’t factor in as we planned our timelines. Make sure to schedule a payment time and pay accordingly. Keeping these operational processes running smoothly will increase people’s confidence in your organization. Make sure to increase your timelines by 25% for any unexpected issues. During our large-scale census surveys, issues constantly come up from the field — feature requests on the application, optimization requests, etc. These are worth considering, since they help the survey application become more robust and optimized for people’s needs. Make sure that your field team is dedicated and hard working. They might have to spend sleepless nights to run the survey smoothly. Want to know more about collecting good quality data? We’ve compiled our learnings on how to build a stellar data collection plan in our first ebook. 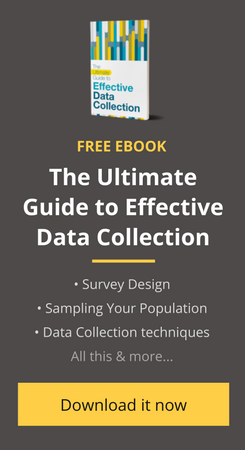 This 30-page guide contains everything you need to know to improve the way you collect data. Download now!